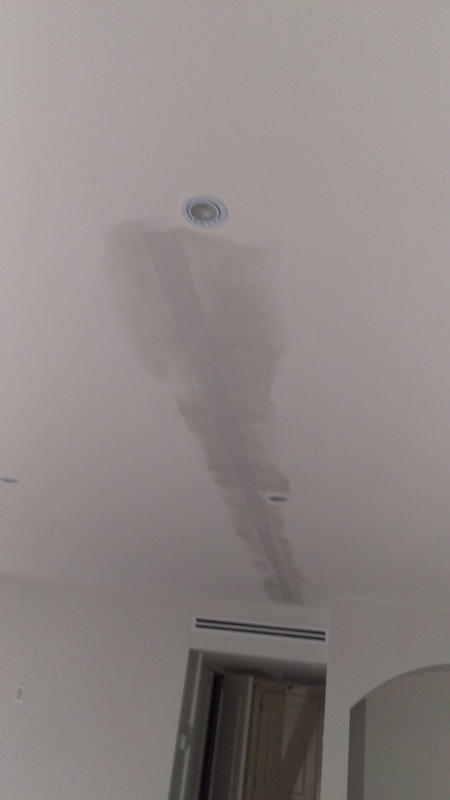 Will you do drywall repairs to my Toronto home? 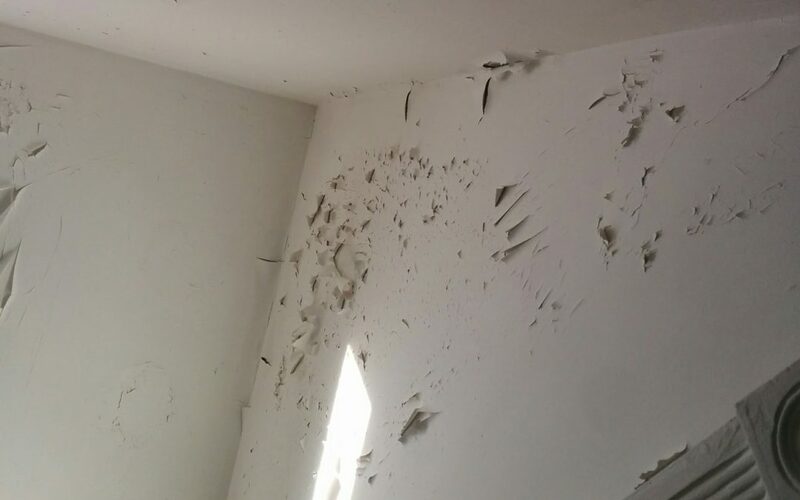 Oops, young Johnny was playing hockey indoors and shot a puck into the wall of yo ur Toronto home, and has left you with a hole in your drywall! What are you going to do? 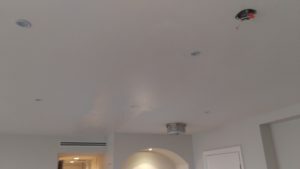 Do you have to hire two different contractors; a handyman to patch the hole and a painter to paint the wall after the patch? 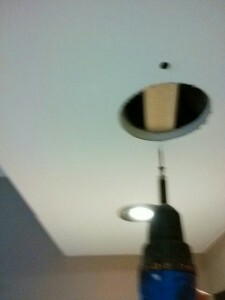 Actually, CAM Painters can fix that hole in your drywall and then paint your whole house from top to bottom after! Or we can just repaint the wall that had the hole in it. 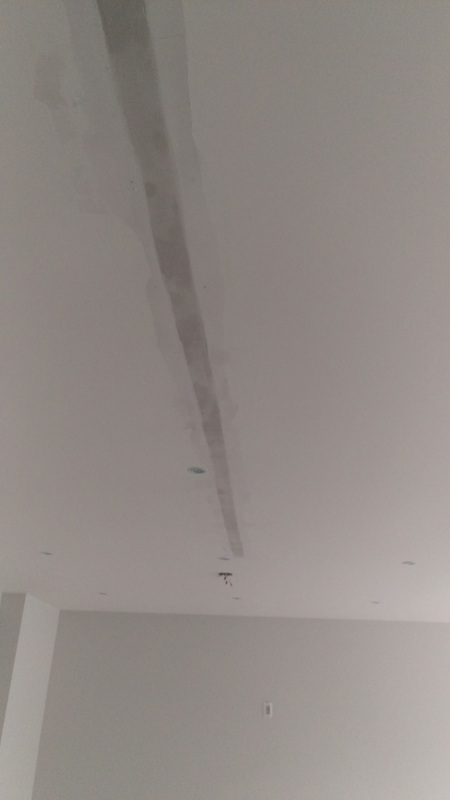 If you want your whole house drywalled your better to get a specialist in, but it’s hard to get a drywall contractor in for one patch. 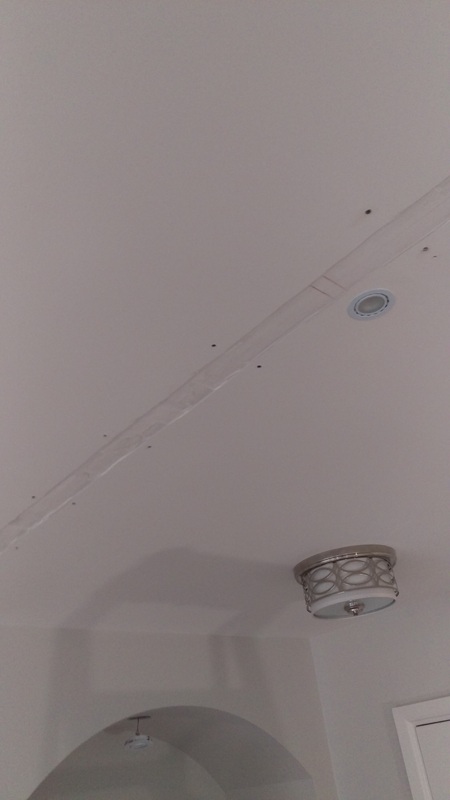 My rule of thumb is that if the repair is less than the size of a sheet of drywall you’re far better off hiring one contractor to do both patch and paint, rather than deal with two contractors. What’s our process for drywall repairs? We drape plastic on door openings to minimize dust travelling from one room to another. We apply our patching compound as smooth as possible. If the patching compound lumpy more sanding needs to be done than if the compound is smooth to start with. We use sanders that hook up to HEPA filter vacuums, so that less dust gets into the atmosphere in the first place. 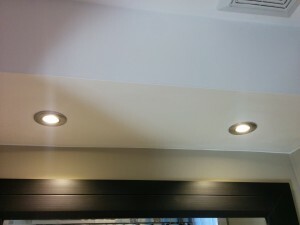 We also ensure that the repaired area is reinforced to prevent future damage. This involves putting wood strapping behind the repair for extra support if necessary. 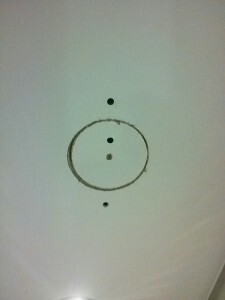 If you have some holes in your drywall that you need repaired why don’t you book a quote? We’d love to Transform Your Home With Lasting Beauty! 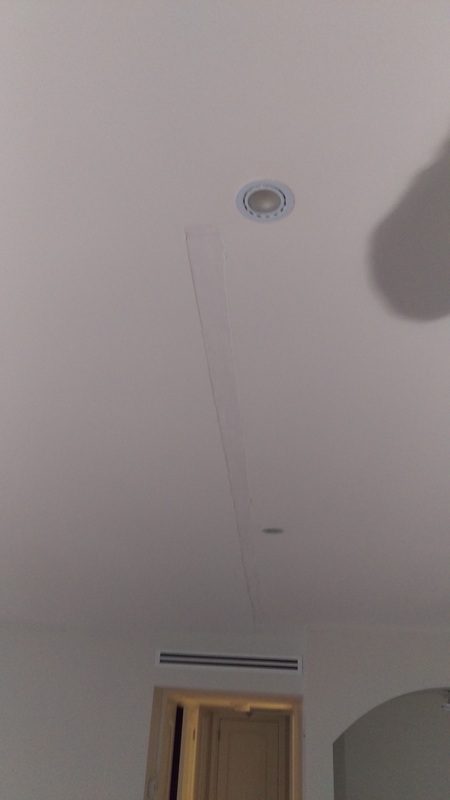 How do I repair a cracked seam in the drywall of my Toronto home? If the tape is exposed you’ll just have to grab it and slowly pull. As you pull the layer of plaster on top will crumble and the drywall tape should come out in one long piece. If the tape isn’t exposed take a putty knife and dig until you expose the tape, then you’ll be able to pull it out of the wall or ceiling. As you pull out the old drywall tape it will make a channel, which you can use to embed your new drywall tape into. So make sure the channel is wide enough to fit the drywall tape you’re planning on using. Use your stud finder to find the studs underneath the wall and then screw into the stud on either side of the crack as shown. This will help stabilize the crack so that the drywall doesn’t shift as much. Pro tip: when screwing the screws into the drywall make sure you sink the head of the screw into the paper on the surface of the drywall, but not so deep that you tear the paper. Make sure that the screws are of good quality as this is more likely to prevent the seam from cracking again. You can browse all sorts of screws from Tradefix Direct. When repairing cracks I prefer to use FibaFuse tape instead of regular mesh tape or paper tape. FibaFuse I have found to be the most durable, and when making a repair to an area that’s cracked I want to make sure that the crack won’t come back. Pro tip: FibaFuse is a fiberglass tape, so it’s best to use gloves when handling it. When you mix your Durabond you want the consistency to be a little thinner than peanut butter. Fill the channel with Durabond and embed the tape, smoothing afterward with a drywall knife to eliminate any air pockets underneath. Scrape off any excess Durabond before it dries because it is hard to sand once dry. Let the Durabond dry before the next step. For this step we use Sheetrock, either the powder or the pre-mix, because it is much easier to sand later. Use your large putty knife and coat over both the tape, screws and an area 4-6″ on either side. Make sure to do one long final pass to keep things as smooth as possible. Go over the area with sandpaper and sand it smooth. 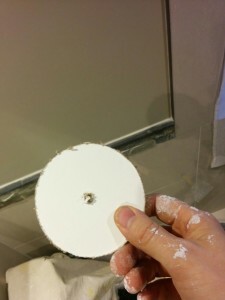 It’s helpful to run your hand on the surface, you will feel ridges in the plaster that you might not see. Prime the area and once it’s dry re-inspect it to make sure it’s nice and smooth. 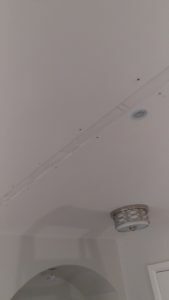 If there are any dents or pock marks fill with Sheetrock. Once the touch ups are dry, sand and apply 2 coats of paint. Always be sure to clean up after yourself! If your walls are cracked and in need of attention, why don’t you schedule an estimate? CAM Painters would love to Transform Your Home With Lasting Beauty! Why is paint peeling on the interior of my Toronto home? Peeling paint is far more common on the exterior of a home than on an interior, exteriors are more subject to temperature changes and the elements, which puts more stress on a paint system. Having said that, paint can still fail on the interior of a home, so let’s figure out what’s happening. Some surfaces don’t let paint “bite” into it, resulting in less adhesion and subsequent peeling. Glossy surfaces need to be sanded and/or primed in order for the finish coat to properly bind onto the surface. 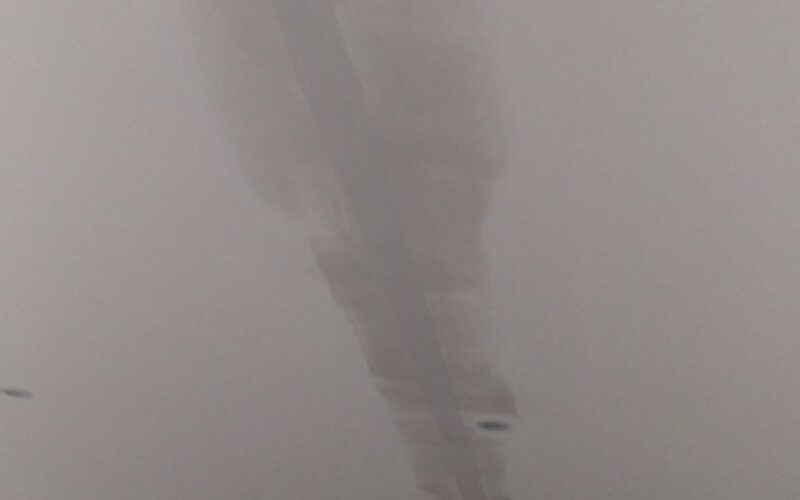 This is why painting a latex paint over an old oil-based paint can result in problems down the road. The oil paint is too glossy for the latex paint to properly bond to, so it’s essential to ensure that old oil-based paint is sanded and primed so that the latex topcoat gets good adhesion. Dirty surfaces can also create problems with paint topcoats. Take, for example, a kitchen, where a thin layer of grease can build up on the walls over time through cooking. 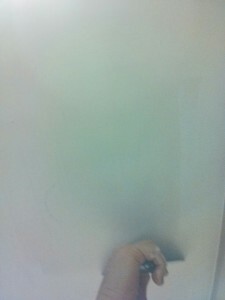 Or possibly a bathroom, where hairspray can miss it’s intended target and build up on painted surfaces. If these are not properly cleaned they can cause issues and cause the topcoat to fail. When we run into dirty surfaces we use a cleaner/degreaser to clean the walls. 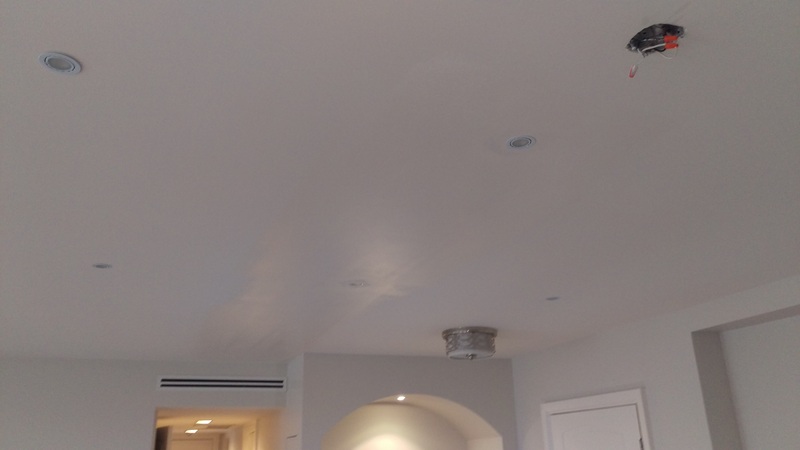 If we think there is going to be any chance of residue we use a very aggressive primer that will bite into these contaminants and seal them properly in preparation for the topcoat. Generally, if it is an issue with improper preparation, only the topcoat will peel. This is sometimes called “tissue peeling”, the paint peels down only to the paint underneath, which is sound. Be careful when purchasing caulking, if the caulking doesn’t say “paintable” on the label don’t try to paint it! Many times, though, ambitious DIYers or handymen will put clear unpaintable silicone over a painted surface. This is very common in bathrooms and kitchens, around bathtubs, sinks, etc. If this has been painted over it will peel and create a mess. If you notice peeling paint around the tub or sink in your bathroom, likely this is what has happened. 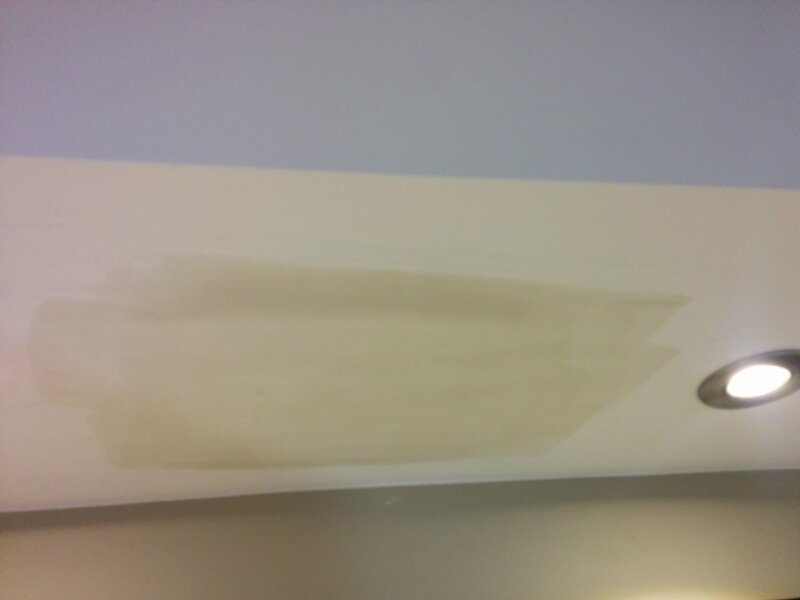 To fix this, the silicone caulking must be removed, the area should be primed, new paintable caulking should be used and the area can then be repainted. This is a little more tricky for a painter to fix. First, the source of the moisture must be eliminated, which involves a plumber, roofer, or some other contractor depending on where the moisture is coming from. 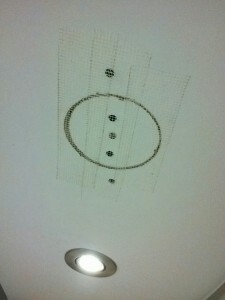 Once that is fixed, we have to assess if the drywall is still sound. Waterlogged drywall should either be left to dry or removed, depending on the extent of the damage. 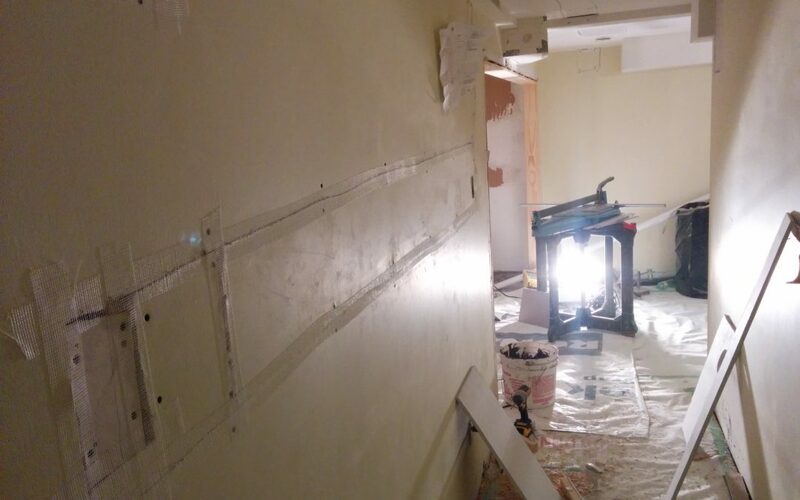 Drywall repairs are then made and the walls are primed and painted. Generally, when moisture is the reason for the failure, the paint peels right down to the drywall. 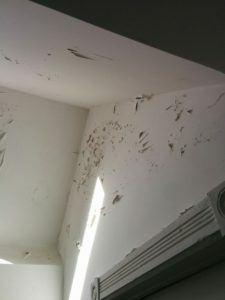 Also, you might notice some mold forming on the surface or the drywall feels soft. If you’ve noticed some peeling paint on the interior of your home, why not book a quote? We’d be happy to stop by and give you feedback and provide you with solutions that will Transform your home with lasting beauty! Patching a hole in the wall in your home is a simple task if you’re handy with DIY projects. I’ll outline how I usually tackle these projects. Either cut a piece of drywall the same size, or use the piece left behind by the contractor (if they are nice they will leave this for you). 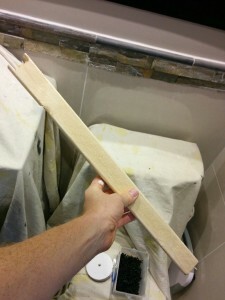 Get a piece of 1×2 lumber and cut it so that it extends past the hole by a few inches on either side. Insert wood into the hole and fasten it with screws on either side. 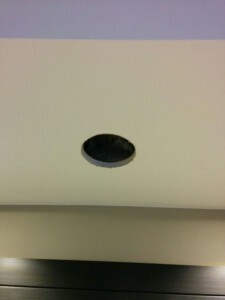 Insert drywall piece into hole and fasten it in position with a screw or 2. Apply mesh tape around the edge of the patch. However, in this case, the patch is small, so I’ve just mesh taped the entire area. Apply a coat of mud over the patch and allow to dry overnight. Usually I will use the premix mud either in the bucket or box. When the patch is dry, sand, give one more thin coat of mud, sand again and paint. Usually for the final skim coat I will use Sheetrock 20 powder because it dries fairly quickly so I can sand and paint the same day. There you have it, step-by-step instructions on how to do an effective and durable drywall patch. If you need any help on your painting projects please schedule a quote, we’d be happy to help you out!